“I am no author, but claim a title which I consider nobler, that of a ‘Mechanic,’” wrote clock-maker Chauncey Jerome in the opening pages of his book, History of the American Clock Business for the Past Sixty Years and Life of Chauncey Jerome, Written by Himself (1860). This son of a nail maker and blacksmith left home at age 11 after his father’s death forced him to seek a trade to earn his keep. He tried farming and carpentry before finding the work he loved best: clock making. After training in Waterbury, he joined the shop of Eli Terry in neighboring Plymouth. Like other artisans, Eli Terry and associates first made their wares one at a time by hand. 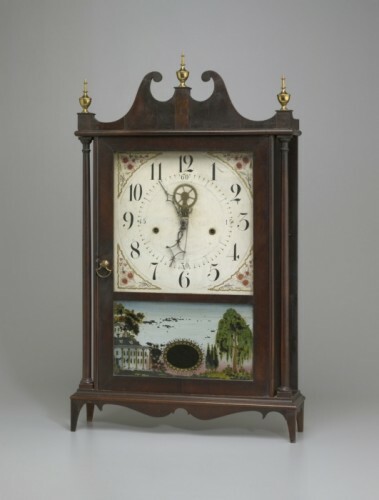 The clocks they crafted had moving parts, or movements, housed in tall, wood cabinets. These timepieces commanded such high prices that few could afford the luxury of possessing one. This changed around 1802 when Terry combined two innovations. He began using only wooden movements (where once he’d also used brass), and he mechanized their production with water-powered saws. This allowed several clocks to be made at the same time and cheaply, too. The year 1816, when Jerome joined the shop, also saw the introduction of Terry’s shelf clock. This smaller design cost less and could be transported more easily by the peddlers who sold the manufacturers’ wares to outlying communities. Data from historian David Jaffe underscores the significance of these developments. Prior to 1802, a clockmaker might complete movements for 25 tall clocks a year at a cost of $25 each, without the wood case. Terry’s innovations increased annual output to 2,500 shelf clocks, including the case, and lowered the cost to $10 apiece. 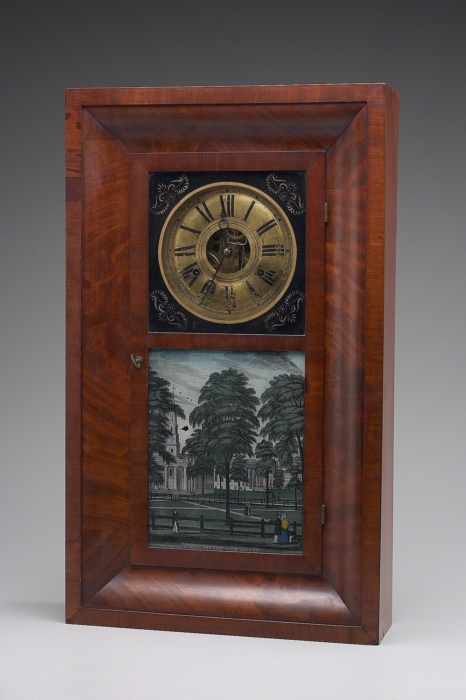 Now, more people could aspire to clock ownership—and the sense of status that came with it. He would finish three or four [clocks] at a time and take them to New York to sell. I have seen him many times when I was a small boy, pass my father’s house on horseback with a clock on each side of his saddle-bags, and a third lashed on behind the saddle with the dials in plain sight. They were then a great curiosity to me. Mr. Roberts had to give up this kind of business; he could not compete with machinery. In 1821 Chauncey Jerome started his own business in Bristol. It encountered mixed fortunes. Things looked particularly dark in 1837 when a nation-wide depression closed many Bristol factories. One night, “feeling very much depressed,” Jerome stared at a clock by his bedside and reflected on the shortcomings of wooden movements. Then, claims Jerome, inspiration hit. The answer? Brass movements but not ones made by hand. Despite Jerome’s assertion that, “It has been no part of my plan to boast, exaggerate, or misrepresent anything,” we must read his story with a critical eye—just as we would any autobiography or diary. His recollections represent just one person’s perspective, and so we must be aware of its omissions and biases. (For example, he offers little insight into his workers’ lives.) Still, autobiographies such as this breathe life into our understanding of history. Clarissa J. Ceglio is a digital humanities research assistant at the University of Connecticut’s Digital Media Center and a member of the ConnecticutHistory.org editorial staff. 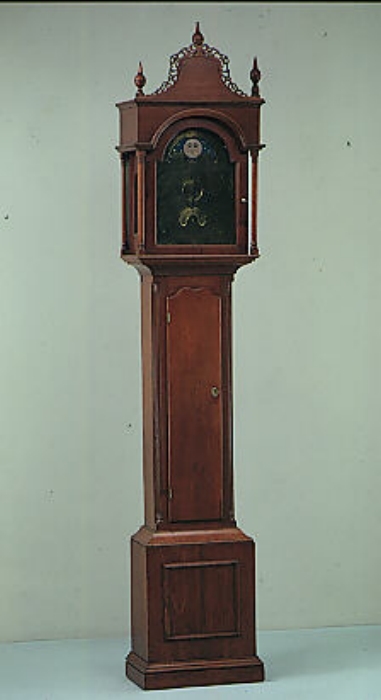 “Chauncey Jerome Clock Company : Herbert Randall Survey of New Haven and Environs, 1880-1920.” Connecticut State Library Digital Collections, 2013. Link. Clouette, Bruce, and Matthew Roth. Bristol, Connecticut: A Bicentennial History, 1785-1985. Canaan, NH: Bristol Public Library, 1984. Jerome, Chauncey, and Lockwood Barr. History of the American Clock Business for the Past Sixty Years, and Life of Chauncey Jerome. New Haven, CT: F.C. Dayton, 1860. Link.